The European Organization for Nuclear Research CERN is the largest and most remarkable research center in the world. Established on the French-Swiss border, near Geneva, it was founded in 1954, gathering specialists from 12 founding member states (among which is Greece). CERN is one of the first European attempts to realize a common vision. The research that goes on at CERN is called Big Science, meaning that which requires the contributions of many states to be carried out. The main subject of research at CERN is particle physics, which studies the components and functions of the universe. Using the largest and most complex scientific instruments in the study of the basic components of matter, the elementary particles and collisions among them, physicists discover the laws of nature. 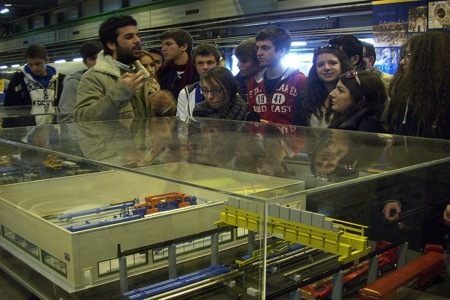 Students who are members of the Physical Sciences club visit CERN, learn about its purpose, talk with scientists (many of whom are Greek), become familiar with the main functions of the accelerator and the activity of particles inside it and, of course, they seek answers to the great questions, such as: What is the Higgs boson, what is supersymmetry and what is the superconductivity of materials. The trip to Switzerland is an unforgettable experience for our students and the memories of the visit are priceless!